You might think you’re in an edgy New York hotel thanks to exposed brickwork, colorful lounge areas and modern art, but the skyline views from the roof terrace give the game away. Touch down in Kuala Lumpur before 4pm and soak in the lively blur of city life, as your private transfer whisks you to your boutique hotel. Malaysia’s effervescent capital dates back to 1857, when a small mining town sprawled into a booming city during the Industrial Revolution. Attracting Malays from nearby villages, British businessmen, Chinese laborers and Indian immigrants, Kuala Lumpur grew into the exotic melting pot that you see today. The largest and most developed city in the country comes with soaring skyscrapers that pierce the cityscape, along with luxe hotels, old colonial buildings and bustling food stalls. After freshening up at the hotel, we’ll head out to bask in the energy of the streets and get a flavor of KL after dark. Toast your fellow Flashpackers and guide over welcome drinks in one of the capital’s dynamic bars, knowing a whole lot of adventure awaits. Today we’ll take a three-hour foray around KL’s insider foodie hotspots, seeing where locals go to get the best grub in town. We’ll start at Brickfields, aka “Little India”, to try yam and sweet potato fritters and tea-time snacks such as vade and curry puffs. We’ll also tuck into Malaysian sweet treats, including fresh banana fritters and cendol; an exotic mix of shaved ice, plum sugar, kidney beans and coconut milk jelly. 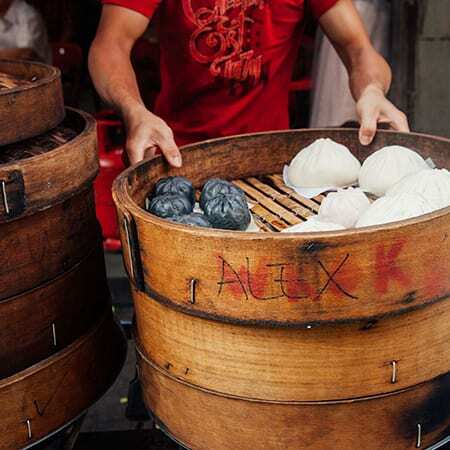 Then we’ll hop over to Chinatown, where you can feast on spicy noodles with lime juice and amazing Chinese pancakes. We’ll finish at an old-school coffee shop, for a cuppa served with kaya toast and coconut jam. The rest of the afternoon is free time to explore KL. Stroll the banyan tree-lined streets to find local parks and tucked-away temples. Pop by mega-sized shopping malls or the iconic Petronas Towers in their 88-storey splendor. There’s also Central Market for local handicrafts. We’ll take a hop-skip two hours south today, to the charming port city of Malacca. Explore the colorful sights of this UNESCO World Heritage City, with its boutique galleries, edgy street art and colonial architecture. This afternoon, we’re going off the beaten path for a three-hour cycle ride through the nearby countryside. Saddle up and spend the afternoon pedaling through traditional Malay villages, amid a maze of rubber and palm oil plantations. Look out for monkeys in the swaying palm trees along the way, with your guide stopping to show you local herbs such as lemongrass, citronella and tropical fruit trees. Cycle past shimmering paddy fields as you bask in this glimpse of rural Malaysian life. Back at the hotel, there’s just time to freshen up and hang out in the fairy-lit courtyard before we head to a great local restaurant for a well-earnt evening meal. Foodies rejoice as we get stuck into a cooking class this morning, with local chefs helping you to rustle up a series of Malaysian favorites. Get to know your chicken rendang from your chicken candlenut, as you whip up an appetizer, a special regional dish and Malay veg – all with plenty of rice and lime juice! Feast upon your creations for lunch then, armed with your new recipes, it’s time to hop on a trishaw. These colorful wheels are a spectacle to behold, with their bright decorations and stereos blasting out tunes. Sit back and savor the ride as you cruise by Malacca’s historic headline sights, including the Stadthuys church and clock tower, the Dutch Square and the Villa Sentosa living museum. Keep note of any places that catch your eye, as this evening you’re free to hit up the local nightlife. Let loose as you hop between bars in this lively coastal city. The terraced valleys of Jasar Mountain are beckoning today: grab your hiking boots for a one-hour hike to its summit. We’ll climb up through lush green scenery to reach the peak, where a sweeping panorama of the Cameron Highlands awaits. Drink in the rolling views of Malaysia’s time-old tea country, amid fresh mountain air and an endless horizon. On our way back down, we’ll pass the settlement of the Kampung Sungai Ubi people, where you can learn more about the lives and history of Malaysia’s tribal groups. We’ll then hike onward through the striking beauty of the Cameron Valley tea fields, discovering unique plants and learning how these verdant hills became fertile ground for the most British of beverages. To toast the process, we’ll finish with a spot of afternoon tea overlooking a picturesque plantation. You’ve climbed a mountain today – a brew never tasted so good. Rise and shine to the sounds of the jungle, ready for a day of exploring Belum Rainforest. Jump onboard our jungle boat and glide through the rainforest waterways in search of the rafflesia, the world’s biggest flower with a speckled red appearance. It only blooms for four or five days and a sighting is far from guaranteed, but there’s plenty more to see as we float toward the salt lick at Jenut Papan. This mineral source is an important habitat for local wildlife, so keep your eyes peeled for Asian elephants, Malayan tigers or even endangered Sumatran rhinos. It’s then back on our boat once more, as we continue our river safari downstream to Ruok waterfall. This stunning beauty spot is the ideal place for a jungle picnic, surrounded by palm fronds and shoals of freshwater fish. More trekking and exploring lies ahead this afternoon in our tropical wonderland, before we return to the hotel jetty. After eating our way through the backstreets of George Town, today we’re heading upward and conquering the iconic Penang Hill. Sitting pretty at 830 metres, the view from the peak offers a magnificent panorama across George Town and the shimmering Straits of Malacca beyond. 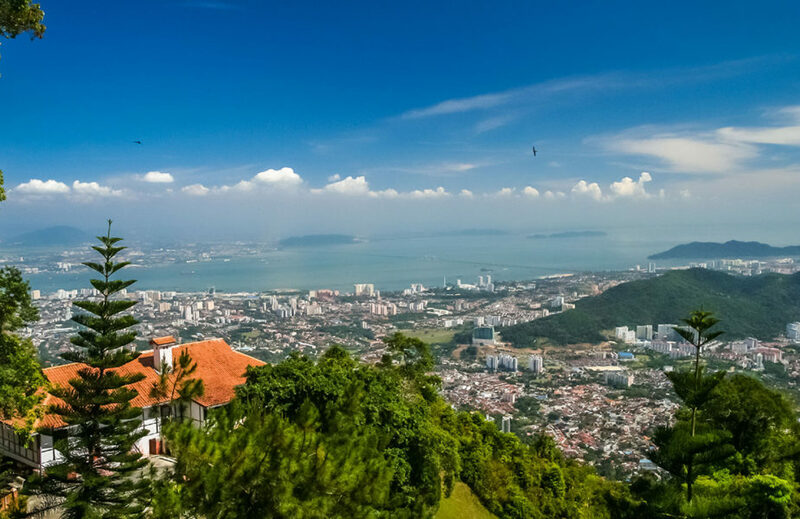 We’ll be hiking three hours or so through shaded forest and botanical gardens to reach this striking summit, where you’ll find a mosque, a Hindu temple, restaurants and impressive views of mainland Malaysia and Penang Bridge. After climbing to the top, put your feet up with a funicular train ride back down to ground level, as the tapestry of the city unfolds before you. From here, the evening is yours to make the most of Malaysia’s foodie capital. There’s plenty of brilliant bars to choose from, or perhaps it’s time to flaunt your new-found street food knowledge by grabbing some more Penang hawker with your Flash Pack pals. After conquering mountains and trekking the rainforest, the last few days of your adventure are designed with palm-fringed escapism in mind. Nestled amongst rainforests, the exotic beaches of Langkawi are calling. We’ll set sail across the Strait of Malacca on a three-hour ferry journey to reach this idyll; an archipelago of over a hundred paradise islands scattered across the Andaman Sea. Check into your luxurious hotel on the white sandy shores of Cenang Beach, complete with a kilometre of private shoreline, spacious swimming pools and a soothing spa. This is a chance for you to do exactly as you please at the finale of your action-packed Malaysian getaway. With snorkeling, jet ski safaris and waterfall hikes at your fingertips, there’s plenty of scope for sun-dappled adventure. Or simply lay back, relax and adjust to the barefoot lifestyle as you embrace your own tropical island dream. Flashpackers, it’s time to say goodbye to Malaysia! Bask in one last wake-up call by the beach before making your own way to the airport. Since touching down here, you’ve feasted on the street food of Penang and Kuala Lumpur, as well as learning how to cook in a Malacca restaurant. You’ve conquered the summit of Jasur Mountain amid lush green valleys and trekked Belum Rainforest by night. And you’ve sailed through the jungle spotting incredible wildlife, making time for waterfall picnics and tea in the Cameron Highlands along the way. All this, with the lovely beaches of Langkawi and a gang of like-minded solo travelers in the mix. Fly out on a high – or grab a longboat and paddle off into the Andaman horizon. The choice is yours.